We are investigating the relationship between environmental factors and ticks and tick-borne pathogen prevalence. Ixodes ricinus ticks are the most important vector of disease-causing pathogens in Europe. They have been increasing in Britain in recent decades and are of particular concern because they transmit Borrelia burgdorferi s.l., the agent of Lyme Borreliosis, and Louping-ill virus (LIV). Ticks and these pathogens have important impacts on biodiversity, animal and human health and the rural economy. In order to manage ticks and tick-borne diseases it is essential to understand the key environmental determinants of tick abundance, disease persistence and spread. Major current environmental changes include climate change and agro-environment and woodland regeneration schemes. We are investigating the relationship between environmental factors and ticks and tick-borne pathogen prevalence, the impact of these major environmental changes on ticks and tick-borne diseases, and assessing the effectiveness of control methods. This is being achieved via a number of closely linked projects, by using field survey data, field and lab experiments, GIS and mathematical modelling. Which environmental factors such as habitat, climate and host communities drive I. ricinus abundance and tick-borne pathogen prevalence? From our network of several hundred tick survey sites from around Scotland, we are using state-of-the art statistical modelling methods to identify the key environmental influences on tick abundance. We are using microcosm, mesocosm and field experiments to identify the mechanisms for these patterns (see sections below). In collaboration with the University of Aberdeen and the University of Glasgow we are also linking environmental factors with human cases of Lyme borreliosis and the prevalence of Borrelia burgdorferi sensu lato, the agent of Lyme borreliosis, in ticks. In collaboration with the University of Zurich, Moredun Research Institute and Scottish Agricultural College (SAC) we are conducting similar analyses for Louping-ill virus. How is climate change impacting on I. ricinus and tick-borne disease risk? Ticks spend the vast majority of their lives away from their host, in the vegetation, exposed to ambient conditions of temperature and relative humidity. Ixodes ricinus ticks can remain active only above a certain temperature but when the temperature is too high and/or the relative humidity is too low, they must return from the vegetation to the ground in order to avoid desiccation. Therefore, changes in climatic conditions are likely to affect the length of time that ticks can be actively seeking hosts and their survival. We are taking several approaches to explore how climate change will impact on I. ricinus. 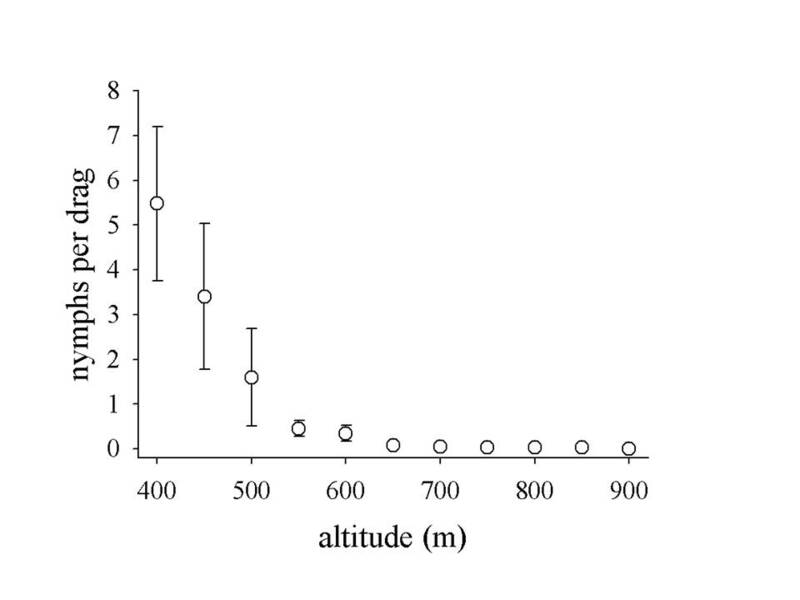 Altitude gradients can be used as a proxy for climate change, and our recent research shows how tick abundance increases at lower altitudes (within the ranges found in Scotland), implying that ticks in cool climates will increase in abundance with climate warming (see Figure right). In the lab we are using our climate-controlled cabinets to observe the differences in tick questing behaviour over different temperatures in mesocosms. In collaboration with the University of Western Australia, we are extending this to explore the differences in response to temperature between I. ricinus ticks from different populations from a cline of climates (NE Scotland, N Wales, S England and Central France (both high and low altitudes)). This will give us pointers for how resilient I. ricinus may be to climate change. We are also using GIS-based modelling to predict how tick abundance might change over Scotland in response to climate change, and we are now extending this to disease risk predictions with climate change using Susceptible Infectious Recovered (SIR) models in collaboration with Stirling University. How are current land use changes affecting ticks and tick-borne disease risk? We live in a changing world and with EU directives to maintain and enhance biodiversity and policies for climate change mitigation, we currently face large and rapid changes in land use. For example, native woodland regeneration is considered good both for biodiversity and as a carbon sink and the Scottish Government aims to increase woodland cover in Scotland from 17% to 25% over the next 10-15 years. By utilising the James Hutton MOORCO experiment - a long-term, large-scale, paired-design, controlled, replicated field experiment - we are investigating how increases in woodland cover will impact on I. ricinus tick populations. Uniquely, this experimental design is able to tease apart the effect of woodland per se from the effect of grazers that inhabit woodlands, such as deer, thanks to the paired fenced/unfenced design. Our peatlands are globally rare and protected habitats for rare and unique species and can be important carbon sinks. We are investigating the effect on I. ricinus ticks of restoring damaged or destroyed peatlands back to blanket bog. We are achieving this by collaborating with the RSPB by conducting tick surveys at their reserve at Forsinard, in the far north of mainland Scotland, where they are instigating the “Forest-to-Bog” project: landscape scale blocks of dense conifer plantation that were planted in the 1980s on blanket bog are now being felled in an attempt to eventually restore the peatlands to their former glory. Muirburn is conducted on many heather moors throughout Upland UK in order to create a mosaic of different ages stands of heather, as part of game management. What is the effect of muirburn on I. ricinus tick populations? To answer this we are surveying ticks at the James Hutton Institute farm at Glensaugh, where a large-scale experiment has been set up to test how muirburn interacts with grazers (sheep and deer) to impact on various biodiversity parameters. In addition to the above three large-scale land use change experiments, we also conduct tick surveys throughout Scotland at a wide range of areas, habitats and land uses, and combine this with GIS-based modelling in order to predict the future abundance of ticks under different environmental change (including land use change, in particular woodland regeneration) scenarios. In collaboration with Stirling University we are now developing these GIS-based tick abundance models for the purposes of predicting risk of tick-borne diseases such as Louping-ill virus and Lyme borreliosis with increased woodland cover. What management strategies can be used to control ticks and tick-borne disease risk? We approach this question in a number of ways, involving a variety of methods from different linked projects. In Scotland, the main host type maintaining tick populations is deer, both roe and red. Therefore, we have investigated the possibility of managing deer in various ways (in particular exclusion using fencing and culling) to control ticks and tick-borne diseases. In the eastern states of the USA, scientific field trials have shown that treating white-tailed deer with acaricide (using feeding stations) can successfully reduce the abundance of black-legged ticks and Lyme disease risk. In collaboration with the University of Stirling, using spatially explicit SIR (Susceptible Infectious Recovered) models we have explored the possible effectiveness of this treatment method in the Scottish situation of treating roe and red deer to control I. ricinus ticks and Louping-ill virus. We have used a similar modelling approach to explore the potential effectiveness of use acaricide-treated sheep as “tick mops” (whereby sheep are treated with acaricide frequently, and vaccinated against Louping-ill virus) in order to reduce tick abundance and Louping-ill virus infection of red grouse, an economically important gamebird. We have also used these models to predict the effectiveness of treating the grouse themselves with acaricide as a tool for improving grouse densities. Sheep can suffer from a variety of tick-borne diseases, such as Louping-ill virus and tick-borne fever, caused by Anaplasma species. In collaboration with colleagues in Norway, Austria and Brazil in a project (TICKLESS) led by Bioforsk, Norway, we are exploring ways to reduce exposure of hill sheep to tick bites in order to reduce losses from tick-borne fever.